During this past week, I finally received my new 40 GB iPod (4th generation). Main reason for the purchase was to replace my 20 GB Nomad Zen, since my music collection could no longer fit on it (yes, I do have that much music, all legal, ripped from my own CD collection in MP3 format, 192 kbps quality). The iPod is one nice portable music player: Nice white finish on the front and a sleek chrome back (on which you can have custom laser etching, like I did). Easy to clean yet the chrome does get scratched no matter what you do, but nothing serious. It has a nice solid feel to it and the controls are superb. Although I’ve never used any of the previous generations of iPods, the click wheel and the menu system are far more advanced than what Creative had to offer on my old Nomad Zen. The menus are easy to navigate and you can control the iPod with just your thumb (from the same hand which holds the device). Simply put, Apple did its homework when it came to the human interface. The headphones are a prefect match with the iPod, they sound great and fit well in my ears. I’m no audiophile, but the iPod does sound as good as my Zen. For the past few days that I’ve had my iPod, I have to say that I am pleased with my purchase (I did get the educational discount, but it was still a fair amount of money to spend!). Easy to use, copious amounts of space (for my music and file backups) and it does have the “coolness” factor (but that was the last factor I was considering when I was looking for a new portable digital player). Sure there are other players out there, but the new 40 GB iPod fulfills all my music needs (for now). 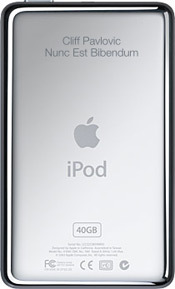 I found some good reviews on iPodlounge.com, one for general users (click here) and one from the point of view of power users (click here), if you want a more in-depth look into the new 4th generation iPods. To transfer music and manage my iPod, I use Anapod Explorer (from Red Chair Software), not iTunes (main reasons are, as of writing this entry, the lack of a Canadian store and that I use other software to rip my CDs). It does all that iTunes can and more (see the site for more details). I got accustomed to the software when I was using the Notmad Explorer with my Nomad Zen. The software just works and the program gets updated on the regular basis (with bug fixes and new features). As for connecting my iPod to my computer, it’s not a problem either with USB 2.0 or Firewire (and it both cases my iPod gets recharged). All in all, the iPod was worth every penny.